Over the years, preparing my EVE accounts to go on a real life trip has changed. Back in the early days of playing the game (2010-2011), my only worry involved selecting a long skill to train until I got back home. Considering I spent two, and even three weeks, in Bulgaria on business, that sometimes wasn't easy. In the following years, I became involved in planetary interaction and during my first few trips to Reykjavik I also worried about keeping my colonies operating. For my return to EVE Vegas, my preparations are pretty minimal, both in and out of game. I have to include out-of-game prep because the meta never shuts down. This year, I picked up a portable charger for my phone. One day at Fanfest this year my phone almost ran out of power. I figure I'd forestall that possibility this week. Twitter is a pretty valuable means of communications. I also picked up a couple of things to drop off with The Open Comms show crew broadcasting the night before the convention begins. In game, the extended skill queue introduced in Phoebe means I don't have to worry about picking out a long skill. I still, however, have to worry about my training time. The Crimson Harvest event gives out cerebral accelerators and I spent part of the weekend collecting them for my three characters currently training. With Biology V, the accelerators give a +10 bonus to all learning attributes for 48 hours. I gathered enough to keep the bonus going until Friday evening Las Vegas time. Unless my laptop magically can run EVE now, I can't use the accelerators while at Planet Hollywood. But I can use them until 2 November, which means I should try to get three more accelerators to use immediately once I get home Monday night. Finally, doing all the things to prepare for EVE Vegas put a crimp into my quest to build a Nestor. I managed to meet the nocxium requirement, so all I have to do is mine enough ore to refine 8,500 units of zydrine and 3,600 units of megacyte. The zydrine I get from mining hedbergite in low sec and the megacyte from arkonor in null. Yes, I know just taking my Prowler to a trade hub and buying off the market is faster and easier, but I set up some rules for my quest for the great white battleship and this close to the goal I'm not about to abandon them. I have a couple more days of work before I land in Vegas on Thursday morning. The event should prove interesting if nothing else, especially since I know where the Starbucks is now. I hope I can use my stars for free coffee. I think I'll need it. 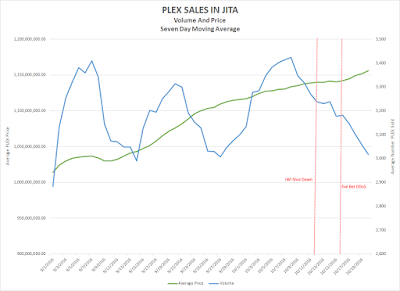 As part of my research into real money trading in EVE, I keep track of the price of PLEX in Jita. The average price of 30 days of game time reached 1.2 billion ISK yesterday. Since CCP shut down I WANT ISK on 12 October, the price of PLEX increased by 4.3%. 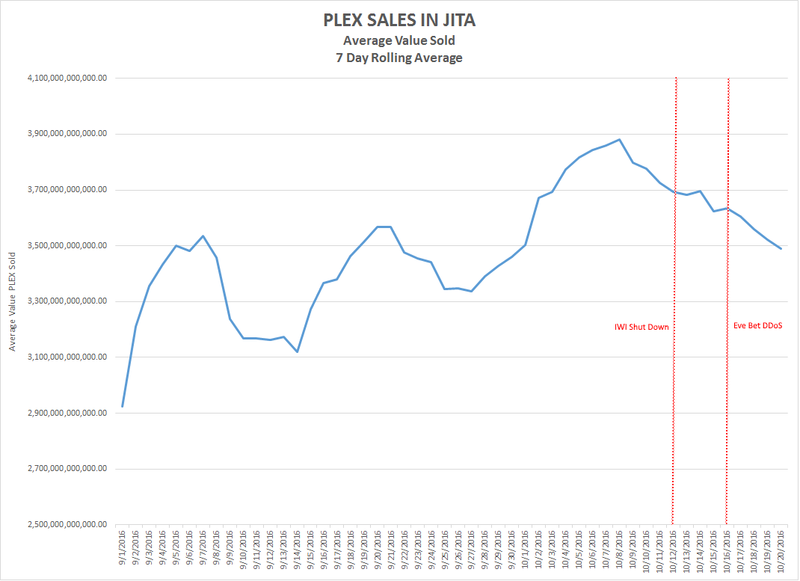 Therefore, CCP's crackdown on RMT activity within IWI, combined with the directed denial of service attack that forced Eve Bet to shut its doors, is the reason that the PLEX price is rising, right? 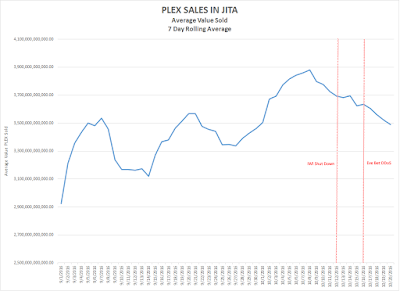 I took a look at the 7-day rolling average of both the average price of PLEX and daily volume of sales and found the theory is probably not true. Since the second week of September, the price of PLEX has steadily risen. The recent rise in price looks like a part a longer term trend, not a reaction to a black swan event. What draws my interest in the market is the demand for ISK. Players exchange game time for virtual currency. 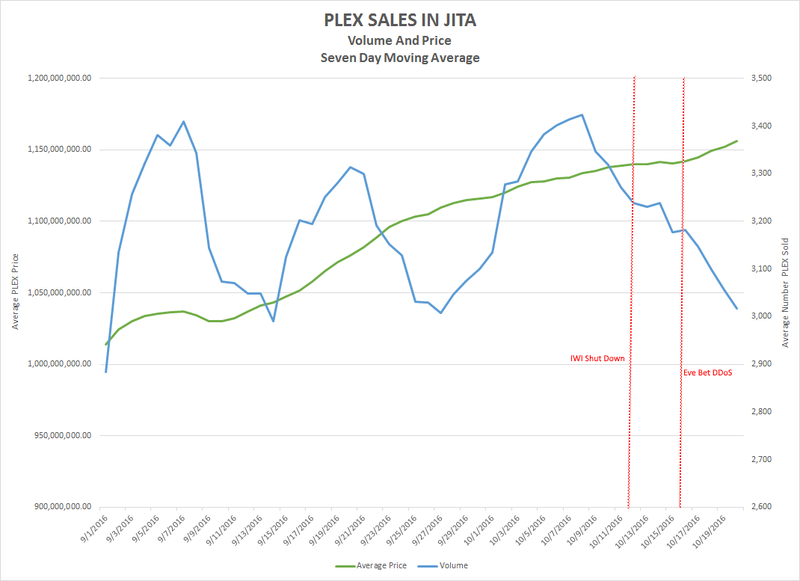 Even with the recent drop from the high demand peak on 8 October, the 7-day rolling average of the amount of ISK exchanged for PLEX still was 19.4% higher on 20 October than on 1 September. Perhaps in the long run the closing of the gambling sites will result in a reduced supply of PLEX on the market. But at this point, I don't see the closing of two of EVE's largest casinos affecting the markets that much. And with the upcoming introduction of Alpha state clones, we may never have the data to know for sure. Your letter demands that Valve "stop facillitating the use of 'skins' for gambling activities through its Steam Platform." In-game items, such as virtual weapons, music packs, or decorative stickers, are common features in computer games. CS:GO customers can purchase skins, or receive them as random drops during game play. They are part of the game. There are two Steam servfices that skins gambling sites appear to use. First is the exchange of skins. Steam allows exchange of various virtual items on Steam, by Steam users for the entertainment of Steam customers. They can take items that they have purchased or acquired via gameplay and trade them with Steam users for other items that they may enjoy more, or sell them for Steam Wallet funds to spend on other Steam purchases. Valve enables the exchange of skins on Steam in one of two ways: through the Steam Marketplace where Steam customers offer Steam Wallet funds to purchase a skin from other customers, or through Steam trading where a Steam customer makes an offer of trade for in-game items directly to another Steam customer. Valve makes receives a small transaction fee in Steam Wallet funds for Marketplace transactions, but Valve does not receive any compensation for trading. Impoertantly, Valve does not allow Steam customers to cash out skins or Steam Wallet fund for real world money. Valve does not charge any fees for user to user trades of skins. Second is authentication of Steam users. Steam offers authentication using an open internet standard known as OpenID. OpenID allows a Steam customer to identify himself on a third party website by association with his Steam account, without having to give his Steam credentials to the third party site. OpenID services are ubiquitous on the internet, as many other internet services, such as Google and Facebook, offer OpenID for their customers as well. None of these activities are illegal in Washington or any other jurisdiction, and we do not believe the Commission contends to the contrary. The Commission's letter publicly threatens Valve with criminal prosecution for gambling on third party sites. We do not understand the legal or factual reasoning supporting this position, from the Commission's letter or from our conversations with the Commission. We are also unsure of how you propose we do this. If there is a specific criminal statute or regulation you believe Valve is violating, please provide a citation. We are not aware of any such law that Steam or our games are violating. The Commissions main argument seemed to be "Valve could stop this, so it should." We do not want to turn off the Steam services, described above, that skin gambling sites have taken advantage of. In-game items, Steam trading, and OpenID have substantial benefits for Steam customers and Steam game-making partners. We do not believe it is the Commission's intention, nor is it within the Commission's authority, to turn off lawful commercial and communication services that are not directed to gambling in Washington. Steam does, however, provide warnings to customers about using Steam trading and OpenID. Furthermore, Valve has taken action itself against skins gambling. As the Commission knows, in July 2016, Valve announced its intent to disable the Steam accounts of skins gambling sites for breach of Steam user agreements. http://store.steampowered.com/news/22883/. We followed this announcement with cease and desist letters of our own to over forty skins gambling sites that we were able to identify, and we shut down the Steam accounts of these sites. However, we do not know all the skins gambling sites that may exist or may be newly created, and we are not always able to identify the "bot" accounts that particular skins gambling sites may use to try to effectuate Steam trades. Cleverly designed bots can be indistinguishable from real users performing legitimate trades and their methods and techniques are constantly evolving. A bot account that is blocked can easily be recreated with a new identity almost immediately. Valve can enforce its user agreements against the Steam accounts of skins gambling sites, where we can identify the site and identify the corresponding account. In fact, we would be happy to cooperate with the Commission, if it is able to identify more skins gambling sites that are illegal in Washington and the Steam accounts through which operate. We welcome the chance for further communication with the Commission, if it would like to clarify the legal allegations against Valve, or alternatively to work with Valve to identify offending Steam accounts of gambling sites. TL,DR. We haven't done anything wrong. We are not currently doing anything wrong. Prove us wrong or go away. The more I look into skins gambling, especially the circus surrounding CS:GO, the more I become convinced that if Valve had just enforced its own terms of service from the beginning, the situation would never have reached this point. Instead, Valve allows a website, OPSkins.com, to operate, converting virtual items into real life cash. I believe the WSGC looks at that relationship as the reason it states Valve "facilitates" gambling. Close up the RMT shop, and the issue probably becomes less problematic. But without skins gambling, the CS:GO eSports scene isn't as popular and skin sales go down. Looks like the story won't go away anytime soon. I wonder what the WSGC will do next. The changes to the EVE Online EULA banning sites like Eve-Bet and I Want ISK may seem like big news, but the current focus in the greater video game gambling world is on the state of Washington. How does Valve plan to satisfy the Washington State Gambling Commission's order to stop facilitate skins gambling? Washington State Gambling Commission Headquarters, LACEY, Washington – October 17, 2016. At the close of business on October 14, 2016, a representative of Valve Corporation notified Commission staff that the company is still working on a reply to the Commission’s Letter and a reply will be provided Monday, October 17, 2016. The Commission previously told Valve Corporation to stop allowing the transfer of virtual weapons knows as “skins” for gambling activities through the company’s Steam Platform. Valve Corporation had until October 14, 2016 to respond and explain how it is in full compliance with Washington’s gambling laws or risk having the Gambling Commission take additional civil or criminal action against the company. The Washington State Gambling Commission was created to protect the public by ensuring gambling is legal and honest. Chances are, whatever comes out of Washington will have a huge impact on how the industry moves going forward, at least in the United States. I'd rather write about that than some of the gambling drama currently swirling around EVE. "Among the interesting developments in EVE Online is the growth of online gaming sites utilizing in-game currency and virtual goods. I don't think that popular sites like EveBet and I Want ISK really worry about real world gambling laws. After all, the money wagered is internet spaceship bucks and not convertible to real world currency without violating the EVE Online End User License Agreement and Terms of Service. No need to worry about lawyers or governments intervening, right?" Over the course of the last three months, gambling regulatory bodies declared the type of gambling operations conducted in EVE Online as gambling that falls under real world laws. On 16 September, two YouTubers in the United Kingdom who operated a website dedicated to FIFA 16-related gambling were charged with promoting a lottery and advertising unlawful gambling, along with inciting individuals under the age of 18 to gamble. The pair pled not guilty on Friday and face a hearing on 6 February 2017. Looking at a white paper published by the U.K. Gambling Commission in August 2016, my analysis indicates that the type of games run by EVE gambling sites fall under the purview of the UKGC. At the very least, in order to comply with U.K. law to operate within the U.K., EVE gambling sites needed to obtain an operating license from the UKGC. "In Washington, and everywhere else in the United States, skins betting on esports remains a large, unregulated black market for gambling. And that carries great risk for the players who remain wholly unprotected in an unregulated environment. We are also required to pay attention to and investigate the risk of underage gambling which is especially heightened in the esports world. It is our sincere hope that Valve will not only comply but also take proactive steps to work with the Commission on future measures that will benefit the public and protect consumers." In effect, regulatory bodies declared unlicensed gambling sites, even if only dealing in pixel money, were illegal. At that point, all of the EVE gambling sites were openly in violation of point 7 in the Terms of Service. 7. You may not violate any local, state, national or international laws or regulations. The change in the EULA just made the violation explicit. I recounted the events over the past few months in order to discuss a major topic of conversation among EVE's chattering & entertainment classes over the weekend. What happens to those content creators who relied on casinos to fund their activities? But I have a slight twist on the subject. What responsibility did people doing business with EVE's gambling sites have in vetting these organizations that turned into their business partners? Admittedly, I am a bit paranoid, but I questioned the longevity of any gambling organization, even one as respected as Eve-bet. I should add I've always wondered what would happen if CCP cracked down on gambling. I divide the EVE gambling sites into two categories. In the first, the organizations have a clean record with CCP and apparently no integrity issues. I put websites like Eve-bet and Eve Online Hold'em into that category. Those sites ran for years with few, if any, issues. Aside from the association with gambling, which is rather important for at least one sub-segment of content creators. While I think those content creators were naive in believing the gambling gravy train would go on forever, I can at least understand any confusion and bewilderment. The second category consists of sites that throw up red flags, such as CCP taking disciplinary action against the site or an association with sites that violate the terms of service of some games, such as G2A. The biggest example, of course, was I Want ISK. When CCP takes action against an organization for RMT multiple times, any content creator taking that money has to know the source of the funding could dry up at any time. Quite frankly, anyone who complains that CCP shuts down such a questionable source of funding deserves any ridicule he receives. Breaking the LawYou must respect all applicable local, national, and international laws while using our services. Any content or activity featuring or encouraging illegal activity is prohibited. I'm pretty sure that urging people to use a service that violates laws in some jurisdictions, such as an unlicensed gambling website, violates Twitch's Rules of Conduct. If I were a Twitch streamer, I would hesitate about putting any advertising at all on my home page, much less tell my audience how great a gambling service is. Streamers can rage at CCP all they want, but the developers can only restrict the flow of ISK and assets. Twitch can cut a streamers access to the platform. I have to admit I don't really have a lot of sympathy for the content creators crying about losing their funding. The sympathy I do have is a result of CCP allowing the situation to continue for so long. CCP decided they would rely on content creators to advertise their game and all of a sudden the rules changed. Those who tried to work with reputable people probably feel betrayed. But those who took money from the likes of I Want ISK? Time just ran out. With the introduction of Alpha clones and a switch to a freemium business model, changes to the EVE Online End Users License Agreement to take effect in November were predictable. I don't think anyone really expected a change to Section 6B of the EULA. I set aside some time last night to play EVE. I normally don't do anything special during the week, but I'm attending a wedding Friday out of state so if I wanted to play around a little with the 118.9 update, I needed to do so before travelling. The patch didn't really add a lot to the game. A big complaint for some people was the removal of the in-game browser. I hardly ever used the IGB, even when using Tripwire. I never play in full-screen mode, so I always have access to an out-of-game browser. Personally, with as much screen real estate as the UI takes up, I couldn't see taking up even more space with a web browser. One change I jumped on right away was the introduction of the command burst charge blueprints. I went out and purchased the BPOs for the skirmish and shield burst charges. The skirmish and shield blueprints I found in the Minmatar Republic. I have the feeling I'll need to do a little travelling to collect them all. But I'll have a good start on researching them. When I get back from the wedding, I'll have the material efficiency maxed out on the BPOs I have. Then I can begin ice harvesting. Of course, I had to do a little work on my quest for the Nestor. I went to low sec and spent about an hour mining hedbergite in a Procurer. I have a couple of belts with a lot of bookmarks laid out so I can almost always stay aligned. I was afraid that with two strip miners running, I might move out of range of the asteroids before I finished off the rock. Thanks to the Higgs Anchor Rig, I can fly slowly enough to stay in range of the asteroids. I completed collecting the isogen I need and managed to get about 40% of the required nocxium. I still have a long ways to go to meet my zydrine requirements, but I got a good start. All in all, an uneventful night. Sometimes a person just needs to go out to low sec and do a little relaxing mining. I do need to kick the rust off my Prospect and find some Arkonor or Bistot, but that can wait for another day. Yesterday CCP Peligro tweeted out a ban wave involving over 100 players who bought ISK off the black market. I use the term "black market" because the ISK came from hacked accounts. In EVE, players wishing to purchase ISK can do so by buying PLEX from CCP and then selling the 30 days of game time to someone for ISK. Purchasing ISK from a third party results in a 7-day account suspension for a first offense or a permanent ban for a second offense. We are less than 30 days away from the launch of Ascension, the latest EVE Online expansion coming to Tranquility on 8 November. The introduction of free-to-play elements to online games usually attracts RMTers, botters, and yes, hackers looking to make a quick buck. EVE experienced a huge uptick in illicit RMT activity in February with the introduction of skill injectors and I expect a similar, but smaller, increase in November. If you want to buy ISK, please go through account management or an authorized PLEX reseller to buy PLEX in order to obtain ISK on the market. Going on the black market just isn't smart. In the November expansion, players will see a major revamp of the dedicated mining boosting ships in EVE Online. I'm not interested in the changes to the Rorqual because I don't fly the ship and will never live out in null sec anyway. I don't think my opinion matters too much, either. Before continuing with a discussion about the Porpoise and the Orca, I should mention a couple of very important changes. First, Mining Director V is no longer required to fit tech 2 mining foreman links. The requirement drops down to Mining Director I. The second is the merging of the capabilities of the Harvester Capacitor Efficiency link into the Mining Laser Optimization link. The merging of a reduction in both the cycle times and capacitor use of mining lasers, strip miners, ice harvesters, and gas harvesters allow the introduction of a new mining link, Mining Equipment Preservation. I don't know how much boosting charges will wind up costing, so seeing a savings in a reduction of wear and tear on tech 2 mining crystals might come in handy. The Porpoise-class Industrial Command Ship is the most affordable and mobile mining foreman platform ever released in New Eden. This new ship fills the hole at the bottom of the mining foreman ship progression line. Although it shares a group with the larger and more expensive Orca, the Porpoise is as cheap as a tech one battlecruiser. Thanks to ORE’s tireless work advancing hull materials technology to reduce mass, the Porpoise is light enough to travel through small-ship wormhole connections. This new ship should be perfect for mining operations in more dangerous space where lower cost ships minimize exposure to loss for the operation. It’s improved agility and warp speed also make it the best choice for providing coverage of mining groups at multiple locations with one ship. The description of the Porpoise describes the ship as a tech 1 battlecruiser equivalent. The comparison even goes down to the ship's warp speed (2.7 au/sec). Defensively, the ship is much weaker with only 4 mid slots and the standard Primae-hull resist profile. Some of that deficiency is made up for with the ship's raw hit point amount rating out someplace between a regular and faction navy battlecruiser. The ship can standardly fit 2 command burst modules in its 4 high slots, meaning that the merging of the two mining links will give the Porpoise similar boosting capacity to the current Orca. The pilot of the Porpoise has an option to fit either bonused remote shield boosters (400% bonus to Remote Shield Booster optimal range) or tractor beams (100% bonus to range, 50% bonus to velocity). The ship also receives a 2% bonus to Mining Foreman burst strength and duration per level of Industrial Command Ships trained. I should note three final items of interest. First, the Porpoise receives mining drone bonuses, meaning that the maximum mining yield is similar to a mining barge, while using a flight of medium drones could result in a max dps of approximately 400. Second, the ship has the 50,000 m3 ore hold the Orca currently possesses. With a fleet hangar of only 5,000 m3, a miner cannot just dump a cargohold full of ore into the Porpoise like a mobile container. However, unlike the Orca, the ore hold of a Porpoise is affected by skills, growing 5% per level of Industrial Command Ships trained. Finally, the Porpoise, can fit into shattered wormholes, finally providing ice miners a support ship with boosts and an adequate cargo to haul the ice out. The Orca is a ship I already use in high sec. I'm glad I already have one as the ship is receiving a major buff. The ship is gaining 3 high slots along with a 400% bonus to remote shield booster optimal range, 250% bonus to tractor beam range, and 100% bonus to tractor beam velocity. The devs also increased the maximum number of locked targets from 2 to 7 in order to allow for pre-locking of multiple targets. The drone changes to the Orca are a bit crazy. Not only does an Orca receive a 10% bonus to drone hitpoints, damage, and mining yield and a 10% reduction in drone ice harvesting cycle time per level of Industrial Command Ships, but also a role bonus of 100% bonus to drone damage and mining yield and 25% reduction to drone ice harvesting cycle time. The drone bay is also increased to 200 m3, meaning the ship can hold several flights of light and medium drones. 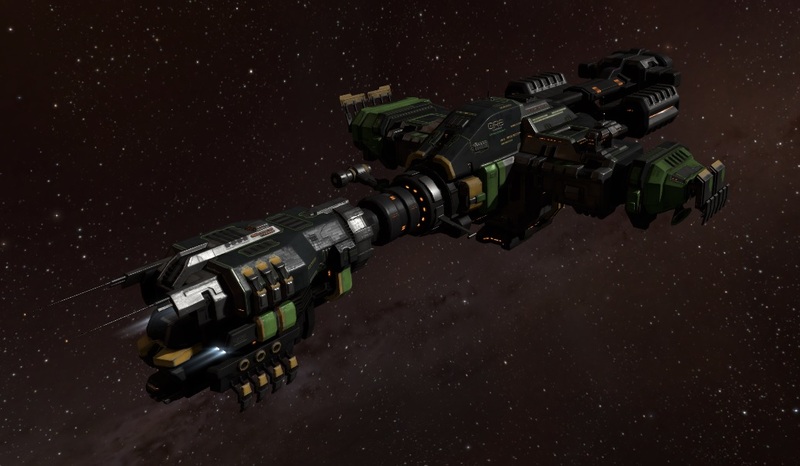 The dev blog indicates the ship can obtain mining yields similar to an exhumer or approximately 800 dps in a combat role. Defensively, the Orca received a big upgrade, with a 176% increase in base shield hitpoints as well as gaining a 5th mid slot. In addition, the ship receives a 1% bonus to shield command burst strength and duration per level of Industrial Command Ships trained. The shield command bursts come into play as one of the changes to boosts is that a boosting ship can always give boosts to itself. What that means is that a Orca can run 3 command burst modules and give itself bonuses, thus making ganking attempts even more difficult. For support, the Orca maintains the ability to standardly fit 3 command bursts with a 3% mining foreman burst strength and duration per level of Industrial Command Ships trained. The ship also has a 50% bonus to command burst area of effect range. Perhaps the biggest change, though, is in the ship's hauling capacity. The ore bay is increased from 50,000 m3 to 150,000 m3. Also, like the Porpoise and unlike today, the Orca receives a 5% ore hold size increase per level of Industrial Command Ships trained. That might even hold all the ore from a high sec belt. All in all, I expect a lot of miners are happy to see these changes. I know I am. I don't think I'll use any of the ships in low sec, but I'll feel more comfortable moving the Orca around high sec. I have the feeling that CCP foresees players needing massive amounts of minerals in the year ahead. I have the feeling we will need to wait until Fanfest next year to find out why. Hashtag activism is alive and well in the EVE community. CCP's resident punster, after a long campaign waged on his behalf on social media, is going to Fanfest this year. Okay, maybe not as cool as players treating all of CCP to pizza, but another indication EVE players are a little different. Real life got in the way last night, but I had to write a brief post involving yesterday's dev blog, Mining Foreman Revolution. The newest ship in the EVE universe is the Porpoise. "The Porpoise-class Industrial Command Ship is the most affordable and mobile mining foreman platform ever released in New Eden. This new ship fills the hole at the bottom of the mining foreman ship progression line. Although it shares a group with the larger and more expensive Orca, the Porpoise is as cheap as a tech one battlecruiser. "Thanks to ORE’s tireless work advancing hull materials technology to reduce mass, the Porpoise is light enough to travel through small-ship wormhole connections. "This new ship should be perfect for mining operations in more dangerous space where lower cost ships minimize exposure to loss for the operation. It’s improved agility and warp speed also make it the best choice for providing coverage of mining groups at multiple locations with one ship." A pretty good looking ship, and a good color scheme. A lot of people will notice the resemblance to that old standby ORE ship, the Noctis. The dedicated salvaging ship has seen hard times as players migrated away from the ORE industrial ship's powerful tractor beams in favor of Mobile Tractor Units. I think a lot of people will welcome seeing the hull more frequently in space. The hull, however, didn't originate with the Noctis. The first ship of the class was the Primae. Introduced in the Tyrannis expansion in May 2010, CCP intended the ship to work with the new Planetary Interaction feature. "A low signature radius (a holdover from its earlier manifestation) adds a layer of defense to the Primae's already decent plating. In addition, the ship's two large bays have been re-engineered to hold equipment for planetside resource extraction and processed materials, making it an especially useful complement to any planetside harvesting endeavor." The Primae had two strikes against it's widespread use. The first was the Primae was a limited run ship, given out to each account with the launch of the expansion. The second was a ridiculously small 1000 cubic meter bay for holding PI products. Using any other tech 1 industrial at the time not only meant less risk, but more efficiency as well. Capsuleers finally got a decent dedicated planetary interaction hauler when the Iteron Mk. III was converted into the Epithal during the Odyssey expansion in June 2013. I have to say I'm excited about the mining boost changes coming to EVE in the November expansion. The dev blog is massive and I couldn't devote the time to do a proper write-up last night. However, I couldn't let the introduction of another Primae hulled ship pass without an early comment. I really look forward to flying a Porpoise now. I am procrastinating just a little in mining the last of the minerals needed to build my Nestor. Instead of running out to low and null sec this weekend, I opened up Pyfa and theorycrafted a couple of PvE fits. To add to the degree of difficulty of my Nestor quest, I might try to build all of the modules for the Sisters battleship as well. That's not an absolute goal, though. Just something floating around in the back of my mind. Sometimes playing EVE is not that exciting. Interesting, yes. Exciting? Not so much. Over the weekend, I spent a good amount of time theorycrafting a fit for a Nestor once I finally finish building the battleship. Yesterday, I reworked the skill plans for two characters and spent about 250 million ISK on skill books. I hit the 50 skill limit in the client and will need to continue loading skills later this week. On my third account, between the time this post is published and the time I wake up on Sunday, the character will learn 40 skills. All of that while watching EVE NT's coverage of the first weekend of the Alliance Tournament, which usually guarantees I do not do much in the game for three weeks. I don't mind too much because we now have the runup to EVE Vegas. Last week we saw not only the release of the CSM Summit minutes but a new video by EVE Online's Executive Producer, Andie "CCP Seagull" Nordgren. I'm excited about the prospect of getting a schedule of events three weeks in advance so I can plan out which events to attend as well as identify blocks of time I can head over to Holsteins and pick up a milkshake or two. The usual standard at the last few Fanfests was to receive a schedule when I was already in Reykjavik, if not when I arrived at the Harpa. Between the CSM minutes and CCP Seagull's video, we know a few details about some of the subjects CCP will unveil at EVE Vegas. The New Player Experience (NPE) is receiving a major rework, including the addition of voice acting. Procedurally generated PvE content is no longer just a pipedream but will see its first introduction on Tranquility in the November expansion. Also in November, players will see the introduction of a new type of structure, engineering complexes. The introduction of the engineering complexes should come as a pleasant surprise to those players disappointed with the thought that CCP did not intend to release any additional structures until drilling platforms sometime during the winter. Of course, no buildup to an event is complete without the mandatory tease of the introduction of a new online store to buy real world EVE items. Based on CCP Seagull's statements in the video as well as the sessions redacted from the CSM minutes, I expect at least three dev blogs to come out between the launch of the 118.9 release on 11 October and the start of EVE Vegas on the 28th. The summit contained two sessions, "Team Genesis" and "Beyond NPE", that CCP could combine into one dev blog. Team Genesis is the development team in charge of working on the New Player Experience. I definitely look forward to CCP Ghost's presentation in Las Vegas on the topic. The second is the session on "Mining and Industry". I assume that the upcoming dev blog will cover the new structures, but I wonder what other surprises CCP has has up their sleeves. The final one involves Team Size Matters, the dev team involved in monetization-related features. With CCP inviting so many people to play EVE without paying a subscription fee, the game company will look to lure the new Alpha clone players to part with some of their money somehow. The upcoming dev blog and presentation in Vegas should prove quite interesting. Normally attendees consider EVE Vegas the more social of CCP's two big yearly player gatherings. But this year, with a major expansion and the introduction of the clone states, players may want to catch CCP's Twitch stream for coverage of the event. They may learn something of value besides which devs can function perfectly with killer hangovers.